Cell phones – 85% of Americans now own a cell phone. 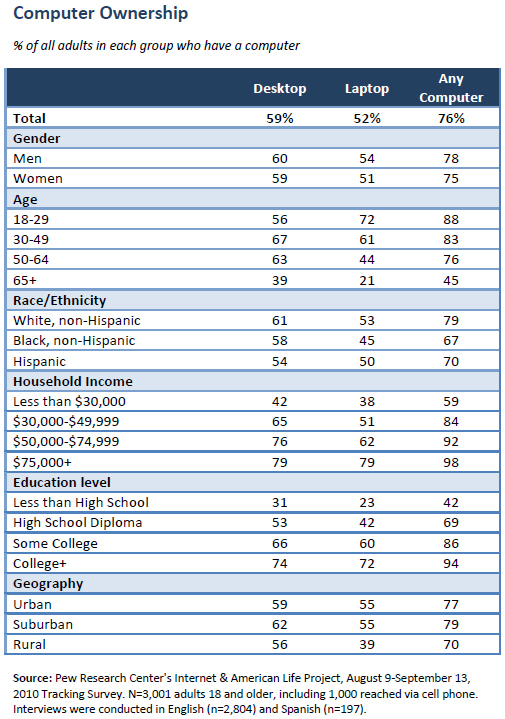 Cell phone ownership rates among young adults illustrate the extent to which mobile phones have become a necessity of modern communications: fully 96% of 18-29 year olds own a cell phone of some kind. Desktop and laptop computers – Three quarters (76%) of Americans own either a desktop or laptop computer. 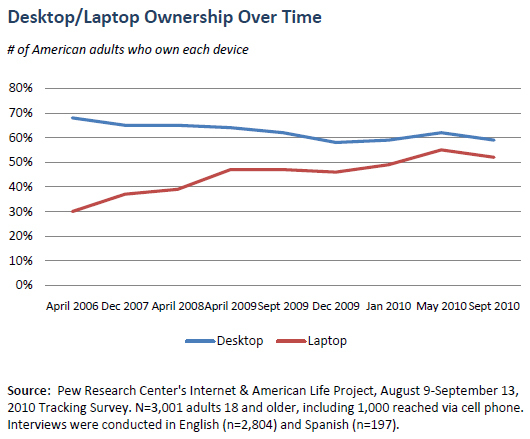 Since 2006, laptop ownership has grown dramatically (from 30% to 52%) while desktop ownership has declined slightly. Mp3 players – Just under half of American adults (47%) own an mp3 player such as an iPod, a nearly five-fold increase from the 11% who owned this type of device in early 2005. Game consoles – Console gaming devices like the Xbox and PlayStation are nearly as common as mp3 players, as 42% of Americans own a home gaming device. Parents (64%) are nearly twice as likely as non-parents (33%) to own a game console. Tablet computers and e-book readers – Compared to the other devices in this list, e-book readers (such as the Kindle) and tablet computers (such as the iPad) are relatively new arrivals to the consumer technology scene and are owned by a relatively modest number of Americans. However, these devices are proving popular with traditional early adopter groups such as the affluent and highly educated–ownership rates for tablets and e-book readers among college graduates and those earning $75,000 or more per year are roughly double the national average. These findings are based on a survey of 3,001 American adults (ages 18 and older) conducted between August 9 and September 13, 2010. The margin of error is +/- 3 percentage points. Interviews were conducted in English and Spanish, and the survey included 1,000 cell phone interviews. When it comes to personal communication devices, the cell phone remains the “gadget of choice” among Americans in 2010—fully 85% of all adults (and three-quarters of teens) now own a mobile phone. Computers are the second-most commonly owned piece of personal technology, as six in ten Americans own a desktop computer and half own a laptop. 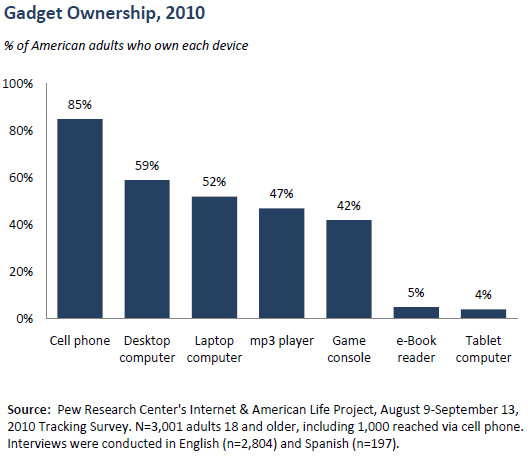 Just under half of all adults own an mp3 player (47%) or console gaming device (42%), while e-book readers and tablet computers are currently each owned by around one in twenty adults. Eight in ten American adults (78%) own two or more of these devices, and the median adult owns three of the seven gadgets we asked about in our survey. Among other factors, device ownership is highly correlated with age. For example, the typical adult under the age of 45 owns four devices, while the typical adult between the ages of 55 and 64 owns two and the typical senior (65 or older) owns just one. Those with high levels of income and education are also more likely to own a relatively large number of devices compared to those with lower income and education levels. As the internet has increasingly gone mobile, laptop computers have grown in popularity. Since 2006, the proportion of Americans who own a desktop computer has fallen slightly from 68% to 59%, while the proportion with a laptop computer has increased dramatically—from 30% in April 2006 to 52% in September 2010. 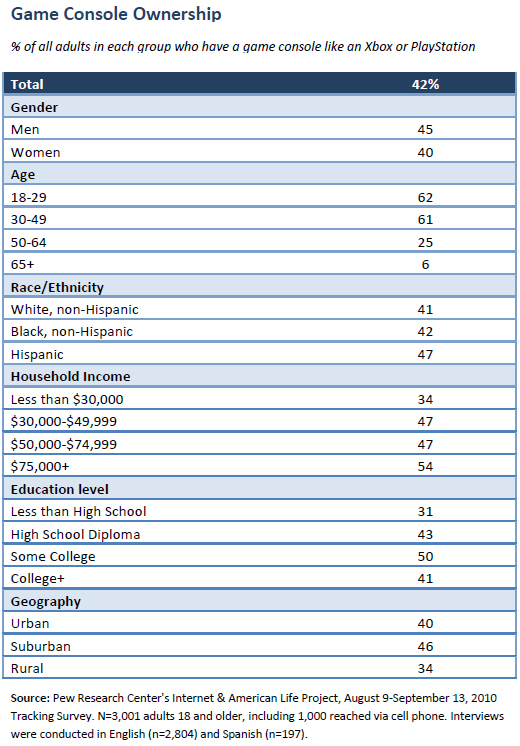 18-29 year olds are currently the only major demographic group for whom laptops are notably more commonplace than desktop computers. Nearly three-quarters of 18-29 year olds (72%) own a laptop computer, compared with 56% who have a desktop computer. 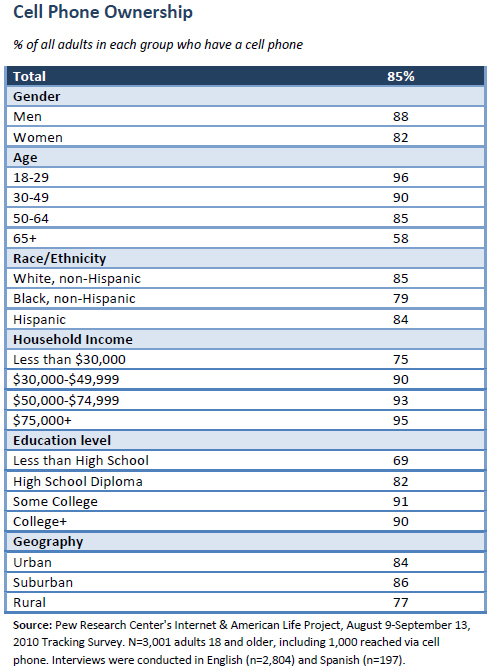 Overall, computer ownership is most prevalent within higher-income households, as more than nine in ten households with an annual income of $50,000 or more contain a computer of some kind. Interestingly, rural residents are just as likely as non-rural residents to own a desktop computer (56% of rural residents and 61% of non-rural residents do so) but are significantly less likely than non-rural dwellers to own a laptop computer (39% vs. 55%). Cell phone ownership has become near-ubiquitous in recent years, as 85% of all adults—and a majority of adults within each major demographic cohort—now own a mobile phone of some kind. Cell phone ownership is especially prominent among young adults, as 96% of 18-29 year olds now own a mobile phone. Yet even among seniors ages 65 and older—a group not traditionally known for its high levels of technology use—nearly six in ten (58%) now own a mobile phone. Put another way, cell phones are as prevalent among seniors as game consoles or desktop computers are among 18-29 year olds. Indeed, seniors are roughly 50% more likely to own a cell phone than to use the internet (40% of seniors are internet users). Just under half of American adults have an iPod or other mp3 player, a figure that has quadrupled since early 2005 (at that time 11% of Americans owned this type of device). As with cell phones, young adults are especially likely to own an mp3 player—75% of 18-29 year olds do so. Game console ownership is highly correlated with age and parental status. While six in ten adults between the ages of 18 and 49 own a gaming device, this drops to one-quarter for 50-64 year olds and just 6% for those ages 65 and older. Similarly, adults with children living at home are nearly twice as likely as non-parents to own a game console (64% of parents do so, compared with 33% of non-parents). 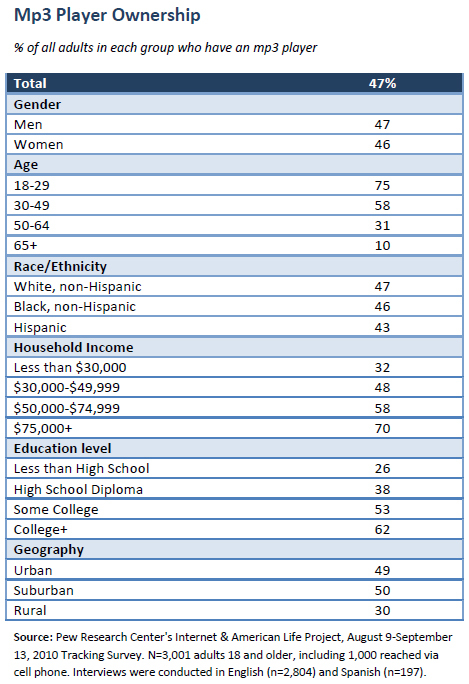 At the moment, ownership of e-book readers and tablet computers is concentrated among college graduates and those with relatively high household incomes. Around one in ten Americans with annual household incomes of $75,000 or more own a tablet PC or e-book reader, while fewer than 5% of households earning less than $50,000 per year contain one of these devices.